The northern walls of Booloominbah with the Gordon Window as centre-piece. 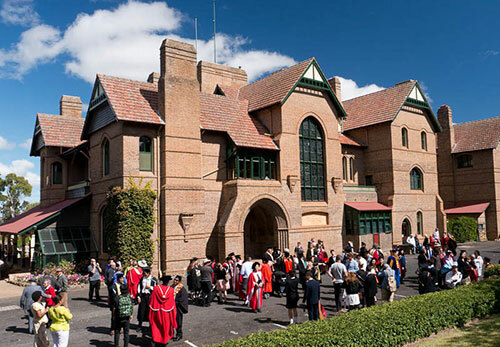 The Gordon Window dominates Booloominbah's entrance hall and fine staircase. 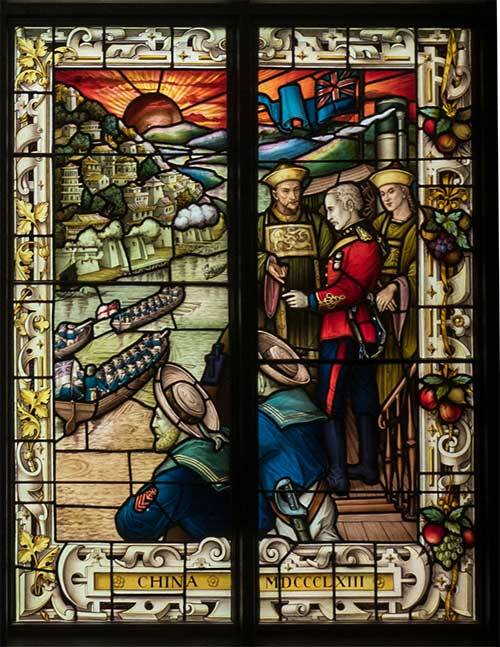 The window contained plain glass until about 1901 when the window commemorating the life of General Charles Gordon was installed by Frederick White (Booloominbah's owner). 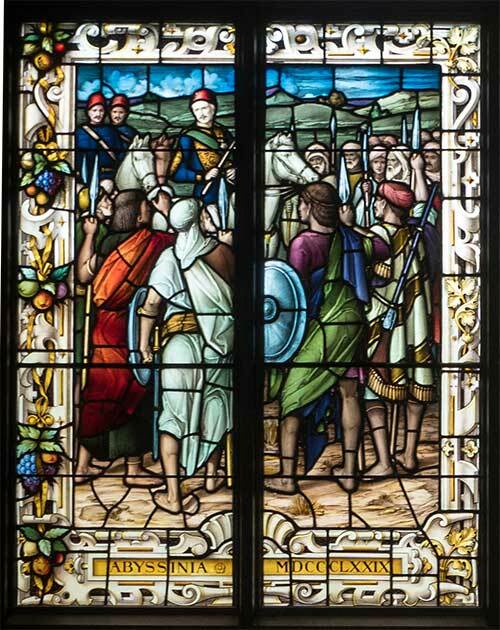 Although White consulted his architect, John Horbury Hunt, about the possible theme to be used in the window, the decision was solely the owner's, with Hunt recommending the London firm, Lavers, Barraud and Westlake (used previously by Hunt, notably for the Anglican Cathedral in Armidale) to commission with the stained glass work. Nathaniel Herbert John Westlake, a principal of the firm, was a Pre-Raphaelite, at the time, who had joined the Lavers and Barraud firm in 1860 and became a partner in 1868. Westlake, born in 1833, fell in love with mediaeval art and became one of the Pre-Raphaelites. 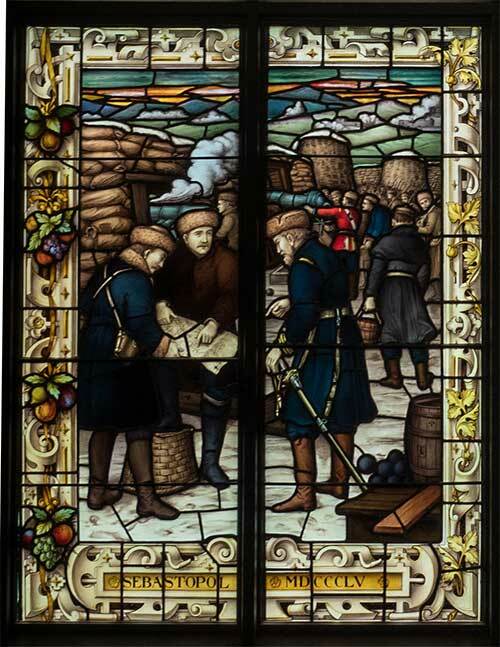 Westlake designed the panels of the Gordon Window. 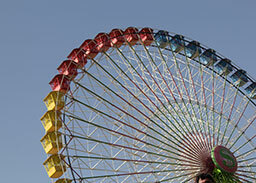 As well as being busy with his own artistic work and management of the firm, Westlake wrote a four-volumed History of Design in Painted Glass, published between 1891 and 1894. Frederick White's choice of Gordon's life for the theme of the large window dominating the hall of 'Booloominbah' was a statement about the period. Gordon's death in 1885 was the occasion for an outburst of British loyalty and Imperial pride, combined with an assertion of a colonial pride and confidence. The contingent of New South Wales troops sent to assist the British in the Sudan, and perhaps to avenge Gordon's death, was seen by one Englishman visiting Australia at the time as a 'demonstration in favour of national identity'. 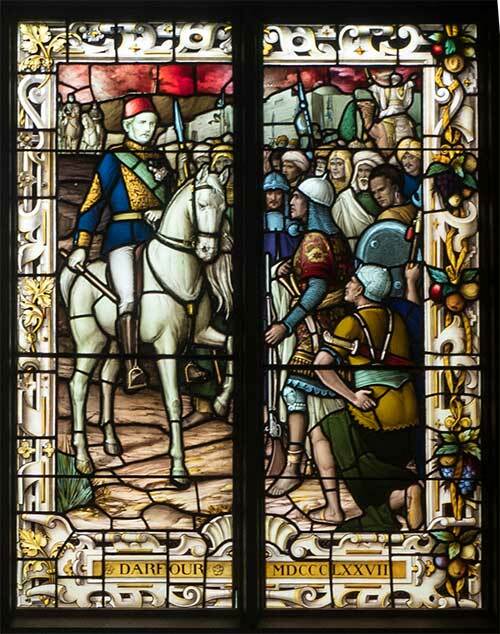 A similar mixture of loyalties was once more being experienced by Australians when White was considering a theme for his window during the Boer War. Gordon's life was well suited to what White's had in mind — to honour personal and public virtues, and Australian nationalism. 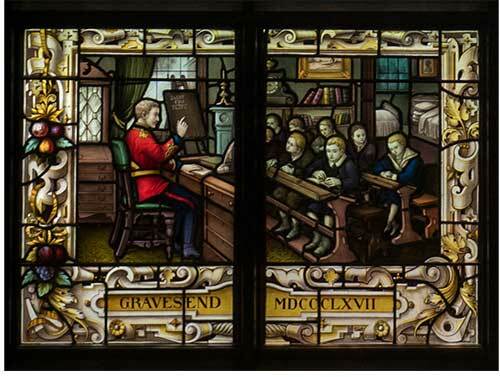 The window's panels contain seven scenes from Gordon's life, each given a year and a place. The Khartoum scene of1885 shows Gordon in the moments before his death at the hands of the rebels led by Mohammed Ahmed, who had proclaimed himself to be the Mahdi. The pose of Gordon, calm and unarmed while trying to reason with his enemies, was the one which became central to the legend built up around his death; the exemplary British and Christian hero whose death was a martyrdom which required British military action to restore the honour of the nation, and to make some moral compensation to his memory. This image of Gordon's death has endured to have a great influence on British and world politics. 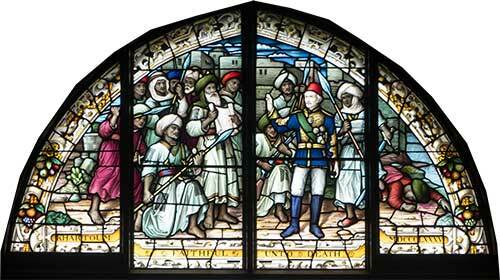 The1879 incident depicted is the futile negotiation Gordon conducted with the King of Abyssinia. It was a minor business but showed something of his persistence, endurance and bravery. In 1877, Gordon was made governor-general of the vast region south of Egypt including the Sudan. In the Darfour area of the Sudan he had a dramatic confrontation with Suleiman, one of the main slave-traders, and managed by little more than the force of his personality to end a threatened rebellion. With his reputation as a Victorian hero well established, Gordon spent about six years in charge of the erection of new fortifications to defend the Thames. He was based at Gravesend and spent much of his time, energy and money trying to help the poor children of the area. He clothed and fed hundreds of boys and, as the scene depicts, taught many in his home and in the ragged schools. The year shown for this scene, 1867, was in the middle of this period, which he counted as the happiest of his life. In 1863, Gordon was in China where he commanded the 'ever victorious army' of mercenaries which assisted the Manchu rulers to suppress the Taiping rebellion. He made good use of gun boats on the canals and creeks of the Yangtze River delta region, and the scene recalls these tactics. At the siege of Sebastopol in 1855 during the Crimean War, Gordon was a military engineer, and he supervised trench-building and reconnaissances of the Russian fortifications. 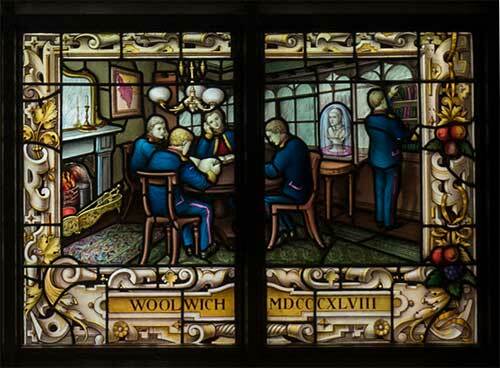 In 1848 at the age of fifteen, Gordon entered the Royal Military Academy at Woolwich.